Terraria is a action-adventure sandbox game video game developed by game studio Re-Logic.The game was first released for Microsoft windows on the 16th of May 2011. 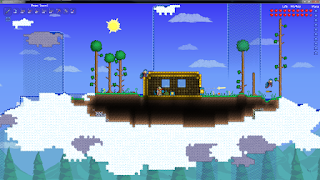 The game is a sandbox survival game.The action and adventure parts of the game are great and the fact that it is a sandbox is pretty amazing too. 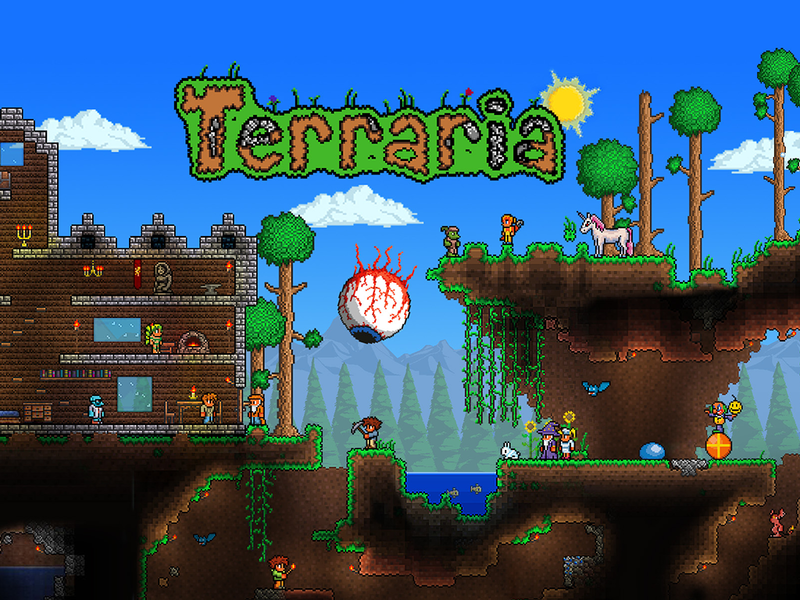 Terraria doesn't have a base story line that you should follow your main objective is to kill different bosses, get amazing god like gear and also get all the NPC in the game to live in your house.It focuses around your character but the game seems to focus on collecting all the awesome gear within the game and makes you want to stay on one character because that one character is maxed out and has all the best gear. The Game play within the game is quiet fun and the fact that you have to fight bosses to get to the different difficulty modes is also gives you a sense of objective without having a actual story. 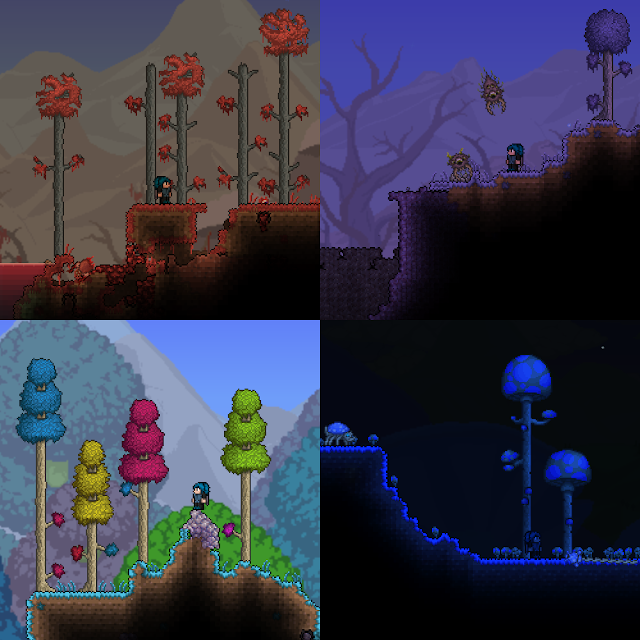 There are many bosses within this game but there are three bosses that most player have defeated multiple times or have at least fought once "Eye Of Cthulhu", "The Eater of Worlds" and "Skelethon"
There are plenty more biomes you can find in Terraria I have decided to show these few because they are my favorite biomes out of all the biomes. The controls in the game are quiet nice and similar for any PC player you have your normal WASD but your D and A are used to go back and front because of the 2D aspect, but W and S is used when flying is used to go up and down and its the only real time is actually there. There are many short cuts within the game for example pressing the H key lets you use a Health potion or pressing R to mount a mount or to unmount. 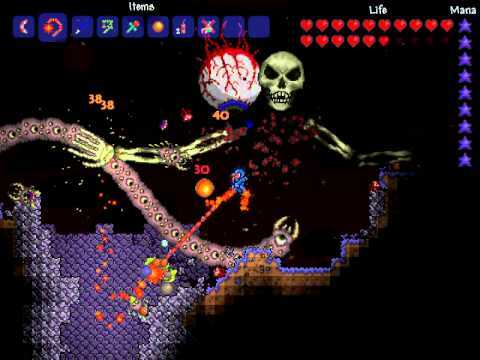 Terraria graphic style is in the form of pixel art.It bring back memories of a time when games were more simple and full of pixel art. It is a game that gives a nostalgic feeling when playing. This shows how the game is more of a pixel based old age game than the newer games like Fallout 4. The Sound effect within the game are quiet good and they give a sense of peace or a sense of terror. The sound and music change base on the biomes for example a snow biome will have a Christmas theme to it and the Hell biome will have a theme that will make you not want to be there even if you need the resources. I believe Terraria has Replay Value to the people who are willing to put in the time to play the game over again because most player as soon as they reach the final phase of armor and weapons they normally give up on playing or they start playing with friends and help them get high levels of gear. 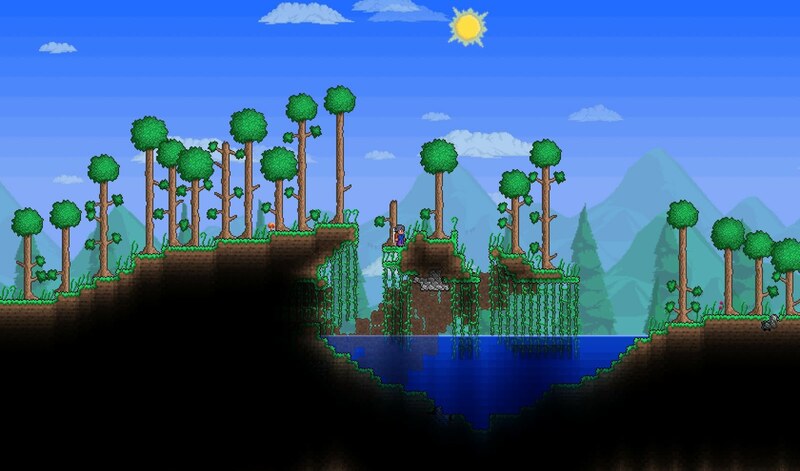 Terraria is a great game with a lot of different adventures that you can have fun with and especially with your friends. It has some replay value if your dedicated enough to actually play-though the game a second time on expert mode with a different character. My rating for this game is a 8/10 because there is a lot of fun activities within the game but there are problem with the multiplayer servers and also with the fact that the game is more of a grind though different worlds to get all the items.